Household, municipal sewage pumping station to pump waste water from residential, office buildings, shopping centers, etc. communal sewage networks or sewage treatment plants here the terrain sewage into them by gravity can not drain. 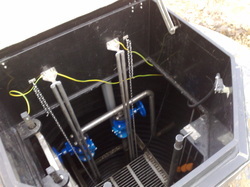 Such a pump station installed in two of simple submersible sewage pumps, which manages the activation control unit so that pumping the reservoir to maintain a minimum water level. Surface water pumps designed to remove waste water from rain to prevent flooding object where the terrain Expert Boarder sewage can leak into storm drains er nearby open water. Uses such as petrol stations, parking, shopping malls and so on. Storm water pumping efficiency depends directly on the Territories of the area and can reach hundreds of liters per second.